You can find here: GB - The Legend of Zelda Link's Awakening, GBA - Classic NES Series The Legend of Zelda, GBA - Classic NES Series Zelda II, GBA - The Legend of Zelda A Link to the Past, GBA - The Legend of Zelda The Minish Cap, GBC - The Legend of Zelda Link's Awakening DX, GBC - The Legend of Zelda Oracle of Ages, GBC - The Legend of Zelda Oracle of Seasons, GC - The Legend of Zelda Four Swords Adventures, GC - The Legend of Zelda Ocarina of Time Master Quest, GC - The Legend of Zelda The Wind Waker, N64 - The Legend of Zelda Majora's Mask, N64 - The Legend of Zelda Ocarina of Time, NES - The Legend of Zelda, NES - Zelda II The Adventure of Link, SNES - BS Zelda 1, SNES - BS Zelda Kodai no Sekiban, SNES - The Legend of Zelda A Link to the Past, Universal tips WII - The Legend of Zelda Twilight Princess. The first Zelda game was released on the NES many years ago. In this section, you can find walkthroughs, cheats, screenshots, release information - basically everything you ever wanted to know about it! Includes information of the updated Japanese verion too! Zelda got updated for the 16-BIT Super Nintendo and wow - it was fantastic. The graphics, music and gameplay were all excellent and many still think it is the best of it's kind, including 32-Bit RPG games! In this section is everything you need to know about this great game! The fourth game has been such as sucess everywhere in the world. It perfectly suited the Gameboy and it's become the most loved Gameboy game of all time. The color version was also released a while ago, have a look in here for stuff on that! Check this area for everything on Zelda 4. Zelda 64 (It's most recognised name) is the fasted selling game of all time and theres no wonder why: It is a fantastic game and everyone loves it! If your stuck on the game, need screenshots or anything else - check this area out. If you haven't heard of this game yet - then check this section out. It's the latest Zelda game from Nintendo which has currently is for the Nintendo 64. It's a bit different than the previous Zelda games but it's pretty good. 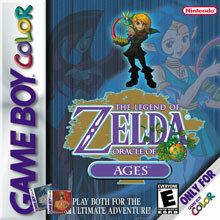 One of the two games being released for the Gameboy Color. 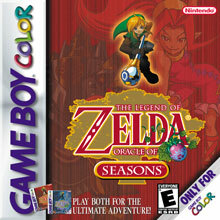 In this chapter, Link must use a "Season Rod" and change between each season so that he can complete his quest. The Japanese game is called "Chapter of the Earth"
The other of the two games being released for Gameboy color. In this chapter, Link must use his harp to travel back and forth in time to complete his quest. The Japanese Game is called "Chapter of Time & Space"
Okay, this isn't technically a Zelda game but it does feature our hero from Zelda - Link! In this section you can find Cheats, information, screenshots and more from the N64's best Fighting game.